Tap into unrivaled peace and serenity when you recline in the Stressless Capri (S). With a high back, generous padding, and smooth armrests, your body will thank you for the comfortable experience each time you sit in this chair. Notice as the Stressless Plus and Glide systems automatically adjust beneath the surface to support your back and neck where you need it most. Twirl with ease and change your view with the sturdy base and 360 swivel. Allow your full body to sink into the cushions supported by the matching plush ottoman. The Stressless Capri (S) recliner is one of the most luxurious recliners in the series offering unrivaled support where you need it most. The Capri (S) is perfect for individuals of smaller size and stature. Plush cushioning and support at every angle invite fast relaxation for your whole body. Relax as the Plus and Glide systems respond and adjust support according to your body’s movement. This ensures your neck and back are in alignment at all times. A sturdy 360 swivel moves with you to change your view in the room with ease. The Capri (S) is complete with the matching ottoman to supports your legs and feet. All Stressless recliners are manufactured with meticulous Scandinavian design and high-quality parts direct from Norway. 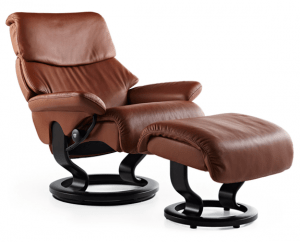 The Stressless Capri leather recliner (S) will melt away fatigue after a long day and leave you filled with peace and serenity. Improve your well-being by investing in ergonomic furniture for a healthy back and neck. With a name like Stressless, you’re guaranteed to receive luxurious furniture made with high-quality materials that will last for years to come. We ship to any address in all 50 United States. Ask for details regarding shipments to Canada. For quality assurance, all Capri (S) shipments must be insured for accident, loss, or damage. Once your shipment leaves our facility, a tracking number is provided via email. Unless otherwise stated, delivery means “to your door”. Shipments must be signed for by someone over 18 years of age.